Planning your Thanksgiving menu or a fall menu? Put this simple and fragrant cider on the burner for family or friends to enjoy while you're visiting. It's easy and delicious, and especially lovely when you use fresh-pressed apples! 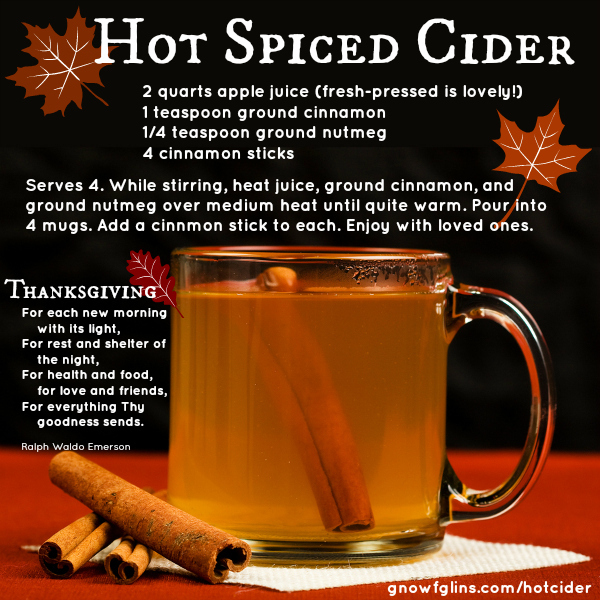 Be sure to let me know if you add anything extra special to your spiced cider, beyond the usual cinnamon and nutmeg. Happy Thanksgiving! Serves 4 (2 cup servings). While stirring, heat juice, ground cinnamon, and ground nutmeg over medium heat until quite warm. Pour into 4 mugs. Add a cinnmon stick to each. Enjoy with loved ones. Pin or Share This One! Here's a pinnable / shareable graphic for your Pinterest or Facebook. Link to this post, or here's a short link to make it really easy: http://traditionalcookingschool.com/hotcider . Happy Thanksgiving! 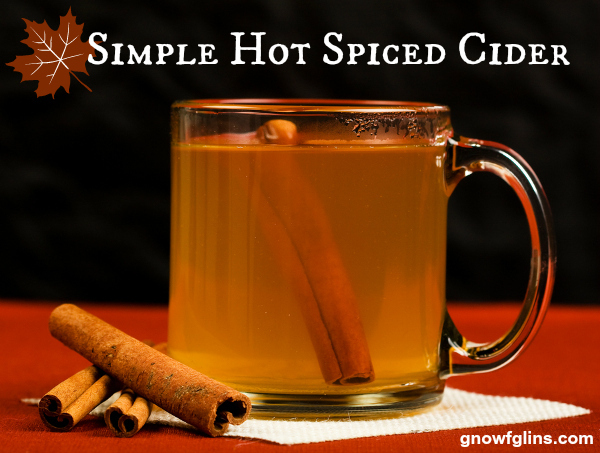 What do you put in your hot cider? How is your Thanksgiving menu shaping up? My husband loves warm cider! But, perhaps a silly question… can you reuse the cinnamon stick? Money being tight right now I’m thinking we won’t be able to pull off that part of it. I’m going to try to treat him to this anyway. 🙂 Thanks for sharing! Malenksha — Oh, yes, definitely! You can also put the cinnamon stick in the cider as it simmers. After a few hours it will be spent. Excellent! Thank you! 🙂 The month has outstretched our budget (we are paid monthly) so next month I will *definitely* be doing this as a treat for my hard-working husband! It is very easy to know when a cinnamon stick can be reused and when it is spent. If it still smells like cinnamon, it is ready for reuse. If it smells like nothing, it is done. It is fun to watch the cinnamon uncurl and recurl as they are heated and cooled. Oooh, thanks Elisabeth! At the grocery store this morning, my boys spotted bulk cinnamon sticks (the cheaper kind) in the produce department. We’ll be back in a week to pick some up for next month… even just once to try it I think would be pretty neat!